Looking for Veterans Day gift ideas? 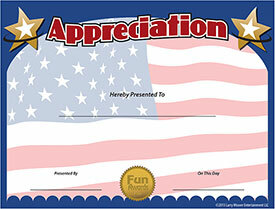 Honor those who bravely served your country with this free military certificate of appreciation template. Download, print, and share this free certificate with your favorite hero. Easily customize the award with your own certificate wording, such as "This Certificate of Appreciation is hereby presented for Service in the Armed Forces of the United States". Please suggest Veterans Day Certificate Wording in the comments section!